When you step out of the back door of the 1920s mansion built near the Don Valley called Graydon Hall Manor you step back into landscaping history. Down the steps towards the fountain built into the stone work and the terrace where you are likely to host your cocktail hour and as the daylight passes into night you are confronted with a beautiful place of serenity. The Manor is lit up behind you from the inside and the lights in the fountain give a glow to the area. This is a perfect setting for the first dance, the mood is right, the family and friends, bridal party and wedding coordinator are encircling the space while your DJ plays the song you chose for your first dance and it is at this moment you realize why you chose to get married to this groom and why at this wonderful Victorian home. Once the launching point of many a hunt into the surrounding acres of property this courtyard is now your place to start of your marriage with a kiss and your first dance. 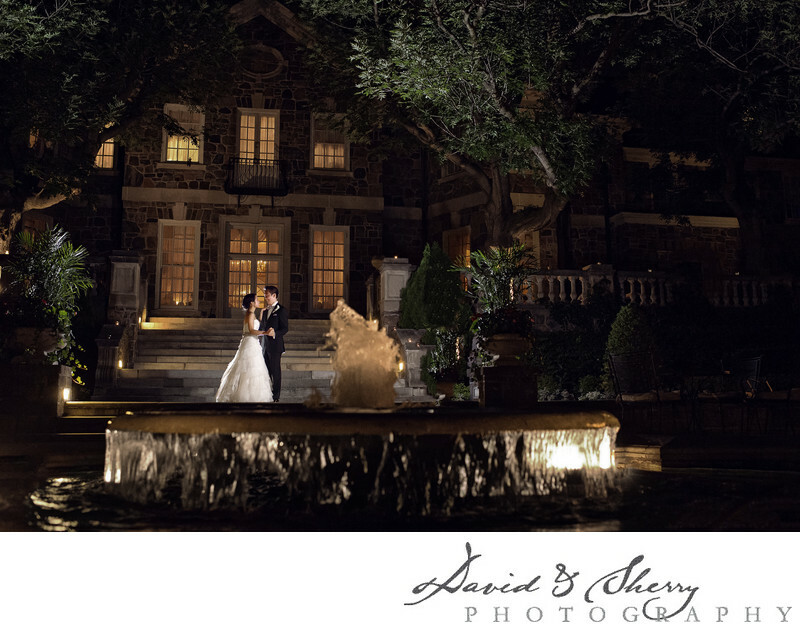 In this particular photo our bride and groom are creating with us their Graydon Hall Manor Photographers, their first dance photos beautifully lit at night while they enjoy some moments together before rejoining the party and dancing the night away celebrating their love for one another and the joining of two families.